This is an editable file. 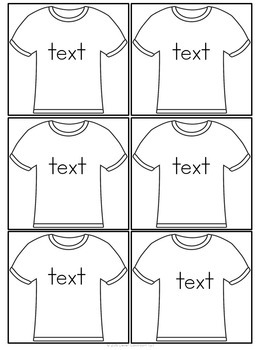 Type in your own text on both the small and large t-shirts. 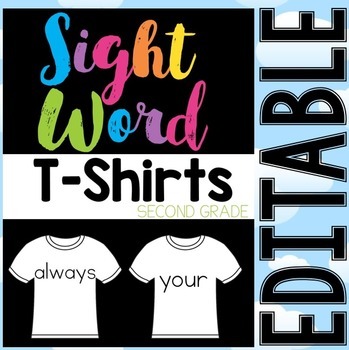 This file is full of new and fun ways for your students to learn and revisit sight words. 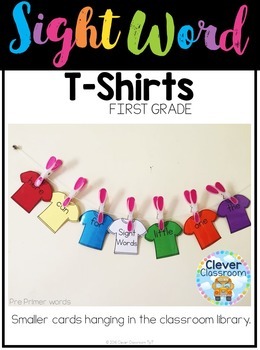 Hang your sight word t-shirts as a word wall or use during small groups. Choose to hang the small or large t-shirts. Use the small cards to play games such as: Old Maid, Snap, Memory and Go-Fish (instruction cards provided. Print and laminate and store in a container or plastic bag with game instruction cards. ★ EDITING: It's super easy to edit this file. Download KG Print Neatly a free font (for personal use) from KG Fonts. Type in your own text and print! Make your own cards, your own way to suit your students, year after year. ~ Please download the preview file for a closer look. 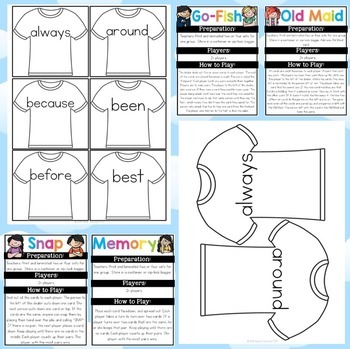 ~ Instructions for four common card games: Go-Fish, Snap, Memory and Old Maid, in both color and black and white. All rights reserved by author. Purchase of this download is for ONE personal classroom use only. Permission to copy for single classroom use only. Electronic distribution limited to single classroom use only. Duplication of this file or any other Clever Classroom files is forbidden and violates copyright law. If your co-workers are interested in this file, you can purchase a second users license by logging back in and going to the product via the ‘My Purchases’ tab on TpT. Each resource in my store has this option and licenses are usually priced at around 50% of the resource.